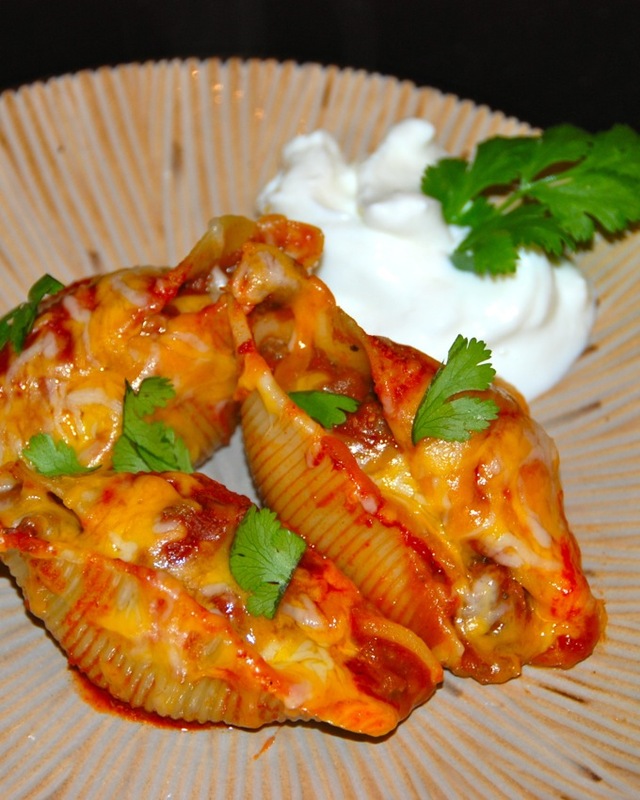 Enchilada Stuffed Shells! Nothing about these sounded bad. 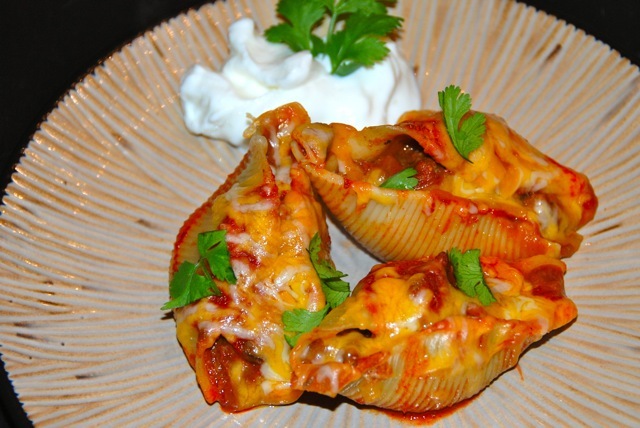 Shells filled with meat and refried beans, covered in enchilada sauce and smothered in melted cheese? Mmmm. They were amazing. Preheat oven to 350 degrees. 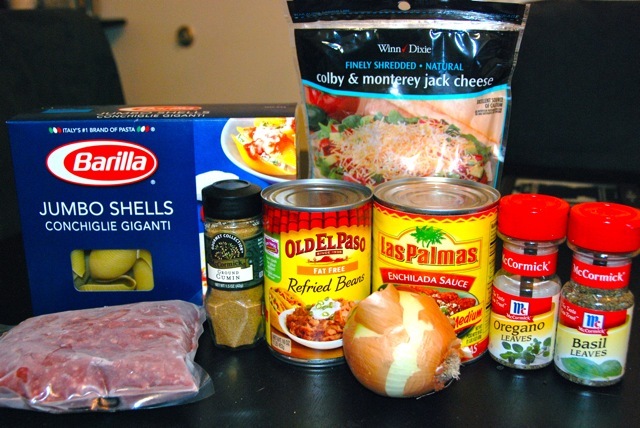 Cook pasta shells according to package directions. Drain and set aside. Heat oil in a large skillet over medium heat. Add onion and cook, stirring occasionally, until beginning to soften, about 5 minutes. Add ground meat, and cook, breaking up with a spatula, until cooked through. Drain any excess fat. Stir in oregano, basil, and cumin. Stir in 1/2 of the can of the enchilada sauce. Stir in refried beans. 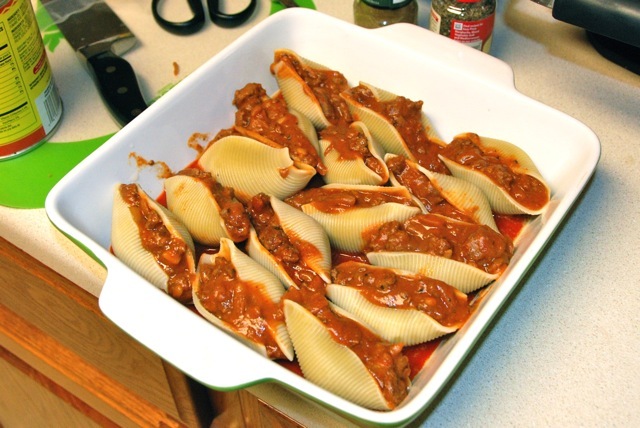 Fill each cooked pasta shell with the meat mixture. Coat an 8-inch square baking dish with nonstick cooking spray and pour half of the remaining enchilada sauce (1/4 can) evenly over the bottom. Place each shell into the bottom of the dish. 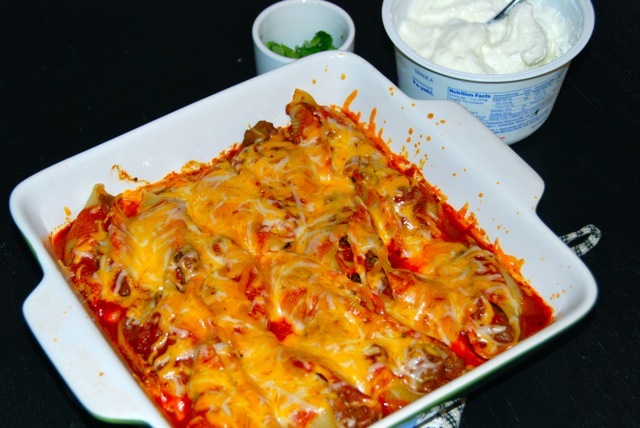 Pour the remaining enchilada sauce over the tops of the shells. Cover and bake for 20 minutes. Remove from oven, uncover, and sprinkle with cheese. Bake, uncovered, an additional 5 minutes, until cheese has melted. Serve with sour cream and cilantro. Loved the shells! If you’re looking for something new to mix up your weeknight dinner routine, definitely try these out!